The developer experience of Delphi just keeps getting better and better. Every day I am glad I chose Delphi 10 Seattle as my primary development platform. Delphi and C++Builder developers will be able to rapidly update their VCL and FMX applications to take full advantage of the Windows 10 wave. Support includes Windows 10 and native WinRT/UWP components and APIs, Windows 10 VCL User Experience controls, and updated Windows 10 FMX support. "Behind the Scenes" this release introduces a re-architected product and build management system that effectively doubles the project size capacity resulting in higher stability and performance when dealing with large projects, particularly multi-platform projects. As a developer if you've experienced limitations or issues with large projects, this release is the must have upgrade. Major changes and improvements have been made to the development, testing, and documentation processes to better accommodate the many platforms and languages that Delphi now supports as well as to introduce new features and functionality across all supported platforms and languages with higher quality, stability, and documentation. Delphi 10 Seattle stands to be the new benchmark for quality, documentation, and stability. 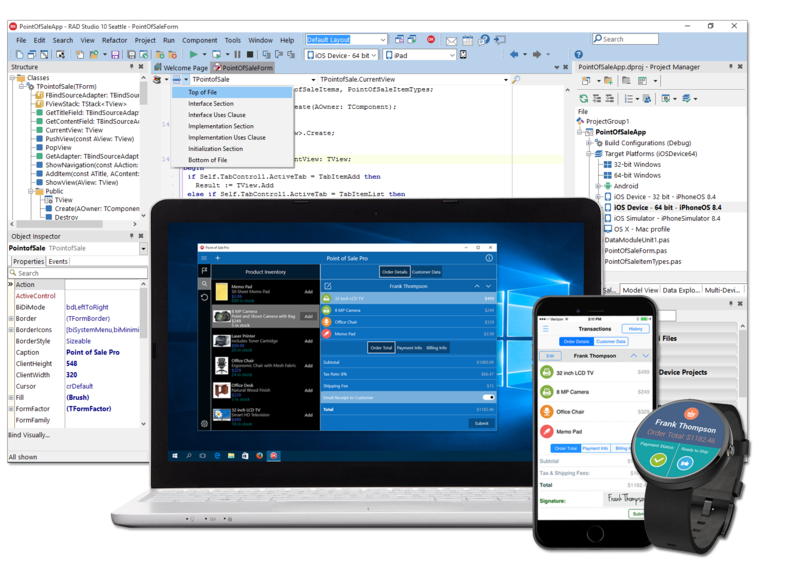 Delphi 10 Seattle is a very serious tool for big complex projects especially when building apps for Windows 10! Enhanced in 10 Seattle! FMX Application Platform for creating native iOS applications for iOS 7.x and iOS 8.x, for both ARMv7 and ARM 64-bit. Supports iOS 8.4. Enhanced in 10 Seattle! FMX Application Platform for creating native Android ARMv7 applications for Ice Cream Sandwich (4.0.3, 4.0.4), Jelly Bean (4.1, 4.2, 4.3), Kit Kat (4.4), and Lollipop (5.x). Supports Android 5.1.1. Enhanced in 10 Seattle! VCL (Visual Component Library) for rapidly building 64-bit applications for Windows 10, Windows 8.x and Windows 7; Windows Server 2008 and 2012. Enhanced in 10 Seattle! VCL (Visual Component Library) for rapidly building 32-bit applications for Windows 10, Windows 8.x and Windows 7; Windows Server 2008 and 2012. Enhanced in 10 Seattle! 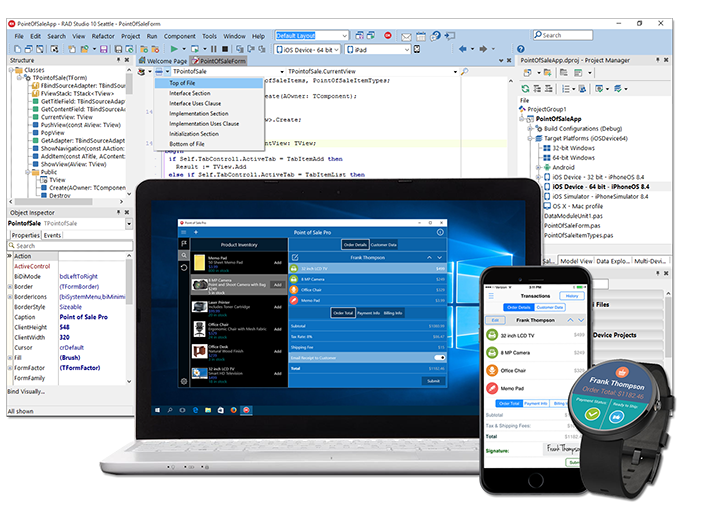 Microsoft Windows SDK support for Windows 7, Windows 8 and Windows 10 APIs. Includes support for calling both classic Win32/Win64 APIs and also WinRT APIs. * Use of GetIt requires Internet connectivity. The feature is not available to off-line developers. Project Statistics provides developers with a clear picture of team productivity with activity tracking. Clipboard History keeps a record of clipboard contents so developers can paste content previously copied. Multi-Paste Support performs the same paste operation on multiple source code lines at once. Modeless and Context-Sensitive Refactoring support which includes: renaming variables, classes, field and properties, inlining, introducing and splitting local variables, removing unused variables, eliminating with statements, extracting methods, adding parameters, and moving classes to a different unit (Object Pascal language only). Stack Bookmarks improves code navigation. Parenthesis Matching provides a visual queue to keep code clear. Flow Control Highlighting provides visual representation of flow jumps in code directly in the editor. Code Navigation Toolbar places classes and methods into a drop down box for easy in-code navigation (Object Pascal language only). Code Analysis tracks code quality with several code statistics like length parameters, nested statements, and cyclomatic complexity (Object Pascal language only). RAD Studio XE7 delivers the only true single source solution for natively compiled applications on Windows, OS X, iOS, and Android. Predefined views including size and layout standards are included for many popular mobile device, tablet and desktop form factors. You can also add your own. Only one "form class" is required across all of the form factors allowing the developer to create a single source file managing all of the common user interface events in one shared source file. The MultiView component is brand new unique FireMonkey component that utilizes the behavior services to dynamically displays itself depending on the form factor and desired platform behavior.